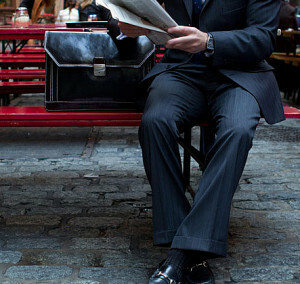 A powerful job position requires a powerful suit, tie, watch and of course, a briefcase. This especially rings true for CEOs, VPs, head accountants, attorneys and lawyers. Organization and appearance go a long way in these kind of job roles. 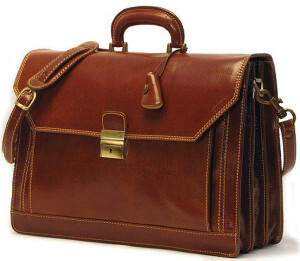 In my review of the Floto Venezia Leather Briefcase, I will be exploring why many have chosen this briefcase to accompany them in their demanding jobs. Beautifully and meticulously handcrafted in Tuscany, Italy. Constructed from high quality polished calf skin leather. Doubled stitched where the seams are the most stressed, ensuring durability and increasing the lifespan of the briefcase. Stands upright stably whether the briefcase is full or empty. 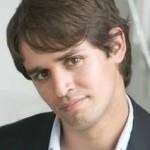 Limited lifetime warranty backed up by an excellent responsive customer service team. No cushioning on the inside for tablets or laptops. Some criticisms that the shoulder strap is too thin and vulnerable. Fits Laptop Screen Size Up to 15.4"
Dimensions (inches) 16" x 11" x 5"
The exterior and interior is made entirely of polished Italian calf skin leather. Handcrafting the briefcase out of polished calf-skin leather, removing imperfections which gives the briefcase its clean and smooth appearance. The seams that are most vulnerable to stress and stretching are double stitched for extra durability. Incorporates durable brass (brown version) and stainless steel (black version) hardware. Hinge pins on the handle are integrated in a certain way that doesn’t allow them to come out unlike some other briefcases where the handle can easily be broken. The bottom design allows the briefcase to stand upright stably whether empty or full. The parallel lined design of the bottom of the briefcase provides stability which enables the briefcase to stand upright whether it’s empty or full, something that is very useful when resting the briefcase. The flapover is securely shut by a real key lock (not an aesthetic one) which is opened by the included small key. There are two colors to choose from – Pure black leather with white stitching, or my personal favorite, dark reddish brown leather with a tan stitching which is a very attractive color contrast. Many people prefer the brown color because it looks more expensive. This of course, is entirely down to your own preference. You’ll be happy to hear that the Floto Venezia feels great when carrying it around whether on your shoulder or by hand. This is because the briefcase doesn’t have a bulky design and weighs just 3.5 lbs. 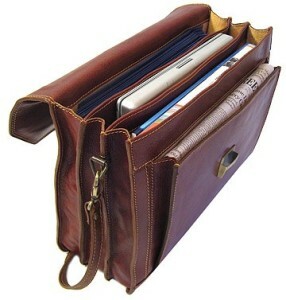 In fact, its depth is only 5 inches at its widest section which is pretty slim when compared with most other briefcases. Therefore, you won’t have to worry about the briefcase constantly swinging in and out whilst hitting your leg. The handle is constructed of the same leather the body is made from, and its thick size provides comfort and a good grip when holding it. The removable shoulder strap is also made entirely of leather also, and has a buckle to adjust the size, and a shoulder pad for an easier carry. However, some users have complained that it’s a bit thin and vulnerable, though Floto do sell thicker and wider shoulder straps. Even though the Floto Venezia is not very big, there’s surprisingly quite a lot of space inside. 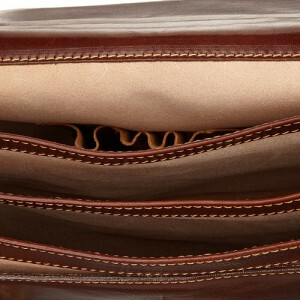 This is because it doesn’t have any additional interior pockets or any cushioning inside which saves a lot of space. Each divider is constructed of soft calf-skin leather with no fiberboard of plastic, allowing more flexibility. On the outside, there’s a large quick access zipper compartment which doesn’t have a lot of space in terms of depth, but it has enough for thin objects such as passports, thin books or smartphones. When you open the flapover you’ll notice that none of the compartments have zips, they’re all open tops. The compartment at the front is slightly smaller than the rest while behind it, there are three larger compartments all of equal size, all of which can hold up to a 15.4” laptop. In the last compartment at the back, there’s a stitched on material on the back wall that provides 4 pen holders. The last thing that should be said about the interior design is that there are no inside markings such as logos and branding which is an excellent design choice since they can often make the briefcase look cheap. If your professionalism is one where your appearance makes a big impact and you don’t want to spend a fortune on a briefcase, then the Floto Venezia Leather Briefcase is one that I definitely recommend because it’s not too expensive, but it certainly looks that way. The quality, functionality and comfort is also top notch. It’s no wonder why the Floto Venezia has scored top ratings and is a favorite among professionals. The briefcase undoubtedly makes a good impression. 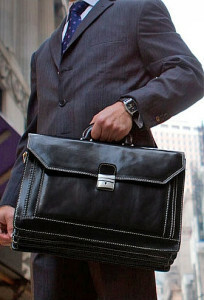 For more briefcases for professionals, you can check this out.